"Everybody needs beauty as well as bread." This has been a summer of self-discovery for me. I've realized a few things: skinny isn't good enough (essay on this topic coming soon), everyone needs some sort of art form in their life, and rest is often underrated but so, so important. "Skinny isn't good enough," is a thought I had one day as I was reflecting on my journey of Pilates. I started doing Pilates on and off last February, but it wasn't until this summer break that I began taking it seriously. I go to individual Pilates sessions twice a week with my trainer, and I've become obsessed. I love that it doesn't aggravate my asthma, it makes me feel tall and strong, and my confidence has drastically improved. I want to reflect more on this thought I've been having - skinny isn't good enough anymore,,, I want to be strong, capable, and lean. As a teacher, it's so easy to get bogged down with the mundane tasks of life - survival, getting through the year, lasting until summer break. As a music teacher, it's easy to lose sight of the beauty of music. My students can barely read music, and getting them to do a simple crescendo/decrescendo is like pulling teeth. I was on the brink of quitting my career forever. I fantasized about being a clerk at Hobby Lobby or a checker at Publix. I was burnt out, exhausted, and unmotivated. And then I found the New York City Ballet. In the past couple of weeks I've become infatuated with the New York City Ballet. I've watched all their videos on YouTube. I've determined my favorite dancers (Tiler Peck and Robbie Fairchild), and I've listened to podcasts that the dancers put out. I've watched clips of all the side-projects the dancers are a part of (ex. Robbie Fairchild was the lead in An American in Paris on Broadway), and I even got my mom obsessed as well. I declared that I wish I had been a ballerina, and I've researched dance classes for beginning adults in my town. To put it lightly, I've become obsessed. It's like a new passion was awakened inside of me. A passion for ballet and the music they dance to. A passion for expression and aesthetic experiences - something that has been missing from my life for several years. This summer has actually been very busy, especially compared to last summer. 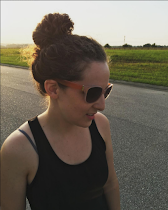 Last summer I was putting up almost daily blog posts, whipping out DIY after DIY, and also sleeping a lot and drinking a lot of tea. 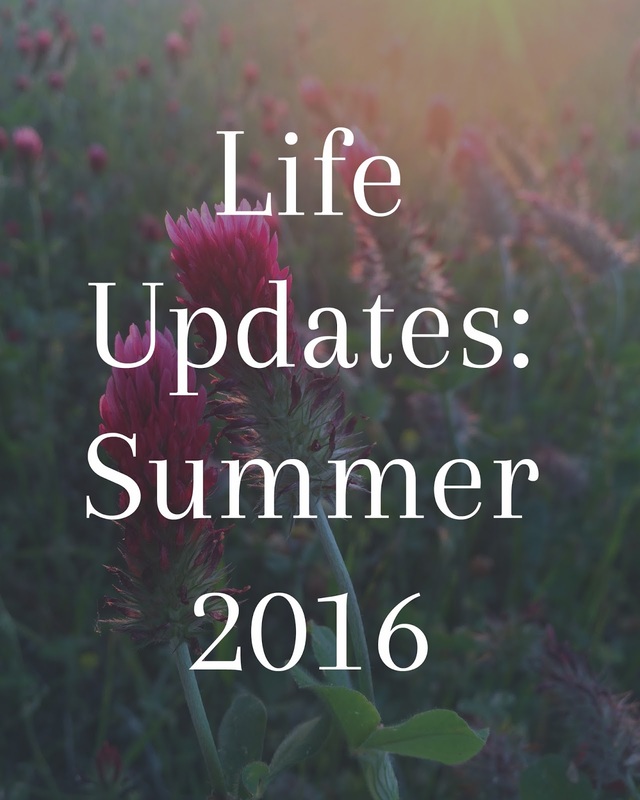 This summer I have barely had any time to think, much less blog. But the one thing I was missing - rest. Rest for my body, mind, and creativity. That might sound like an oxymoron, especially after I just spoke about having my creative passions reignited. But honestly, any art, DIY projects, music, stories, etc. I could try to create right now would come out feeling forced and frustrated. I have needed this time to just let my creativity rest. Let my mind be free to wander and think about whatever I want. I think there is a lot of good to come from just daydreaming. Getting lost in thought. And eventually, when the time is right, I'll begin to create again. And the more I allow myself to rest, and the more I think about life and music and art, the more I want to keep learning. I find myself not feeling the urge to pick up a paintbrush, but instead wanting to delve into a theoretical analysis of Bach's B minor Mass. I find myself thumbing through old music history books and notes, reading for pleasure books like "The Conductor's Art," or "Choral Music Through the Ages." Art inspires art, and the more I can continue to be inspired by learning, the more enriched my life will be. Rest is good. Let yourself rest every once in awhile. John Muir said, "Everybody needs beauty as well as bread." We all need art and self-expression. Without it, life wouldn't be worth living. I've discovered a few new things about myself this summer, and I've rediscovered my love, and need, for beauty and art. Some of my favorite blog posts to read (and YouTube videos to watch) are "hauls." I love to see what other people pick up when they shop at my favorite stores! If you missed my Trade Joe's Haul, click here. We don't have a Whole Foods near us (the closest one is 3 hours away! ), so when we get the chance to go to one, I try to stock up. Whenever I go to Whole Foods, I try to look for brands that I can't find at any stores near me. You can order many of these products online, but I prefer to buy in-store because then I can color check, smell, and most importantly, not pay for shipping! Alaffia African Black Soap (Body Wash/Shampoo/Shaving Soap/ and more) - Natural ingredients, fair trade, supports Bicycles for Education, Maternal Care Project, Reforestation Project, School Supplies Project, and Eyeglasses project. The peppermint smell is yummy and not overpowering. Side note: My 5th and 6th grade students sang a song for their end of the year concert called "Fanga Alaffia" and it is a song of welcome. I love that this body wash is named that! Pacifica BB Cream - All natural, mineral ingredients. Gives an illuminating, perfecting tint to the skin for a natural look. The ingredients are very beneficial to the skin, as well. It has a shade matching tint, but it is very sheer coverage. Don't expect it to work like a foundation - it's more of a primer. Now Bamboo Ultrasonic Oil Diffuser - Heat-free diffuser. The bamboo looks very pretty on my kitchen counter. It diffuses pretty well! Badger Sunscreen Cream (Zinc only, no crazy chemicals...) I got SPF 35 and 30 only because they didn't have any more 35s. Blue Glass Bottles with Dropper and small blue jar - for us to use to mix our own bear oil (for Peter, obvs), massage oil, and other essential oil-based tinctures or beauty items. 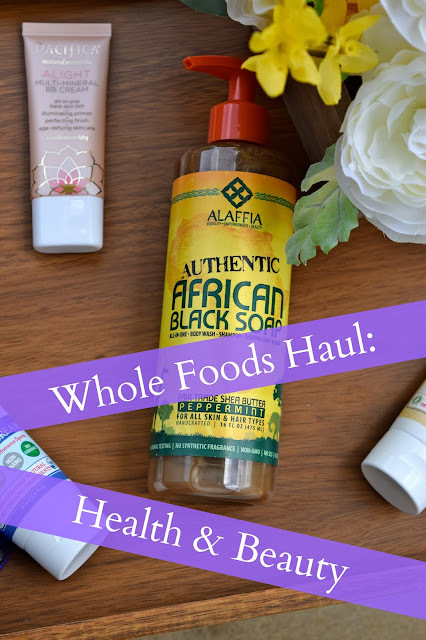 What are your favorite health and beauty items from Whole Foods? I don't know about you guys, but some of my favorite blog posts to read (and YouTube videos to watch) are "hauls." I must be very nosy, but I love to see what other people pick up when they shop at my favorite stores! We don't have a Trader Joe's near us (the closest one is 3 hours away! ), so when we get the chance to go to one, I try to stock up. Whenever I go to Trader Joe's or Whole Foods, I try to look for brands that I can't find at any stores near me. Certain brands, like Burt's Bees, can be found at Walgreens, Walmart, and sometimes even grocery stores. Trader Joe's has their own "house" brand of many household and beauty items, so I grabbed a few while I was there. I'm trying to detoxify my health and beauty items as much as possible, so I look for natural ingredients (that I know what they are). 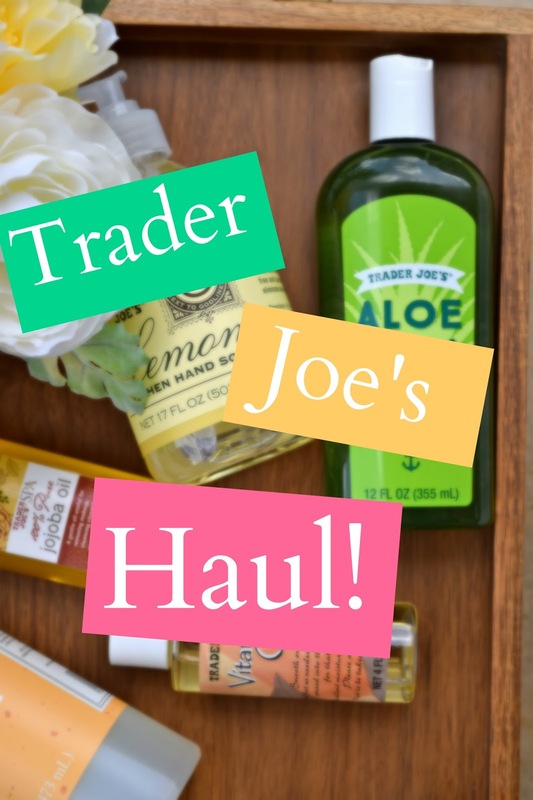 Some of Trader Joe's items aren't completely natural or organic, but I found these to be better than conventional items you would find at Target or even Sephora. And these are way cheaper, too! Hope you enjoyed getting a peak into my shopping bag. What are your favorite things to get at Trader Joe's? I'm going back to work in a few weeks, and I'm sure my blog will be neglected once again. I'm also running out of ideas for posts and feeling generally "blah" about the whole thing. When we lived in Rio, there were hundreds of things to post about. We were constantly out exploring the city and doing new things. So I felt like there was something of interest to share on here. Now we are just stuck in a routine - work, eat, sleep, repeat. There is nothing interesting to explore around where live, and even if there were, it's way too hot at the moment. I'm not doing many DIYs at the moment, and even if I were, who would care? There are so many blogs of full-time DIYers, and just a quick glance at Pinterest will show you that anything I could attempt would be irrelevant. Sorry for the negative-Nancy post, but that's just what I'm feeling at the moment. It's hard to be creative on command! I DO think I'll keep my blog active though, because you never know what the future holds. I'm hoping that in the future I won't have to work full time, and then I'll be able to designate more time for the blog. We are staying in Alabama for at least one more year. We both signed contracts and are working for the school. I'll have a modified schedule, so hopefully I won't be as busy and stressed-out as I was last year! (If you remember, I wanted to quit my job almost immediately after school started, and then again at least once a week throughout the year...) It feels very strange to start our third year in one place. My wanderlust is definitely kicking in, and I'm hoping our summer vacations can tide me over for the time being. I'm already stressing out over my schedule and how I'm going to fit everything in. I have to fit my private students in somehow, I want to continue doing Pilates two times a week (or three! ), I want to join the community orchestra, and I also want time at home with my husband and dog. I really hate being gone from the house for 12+ hours a day, so I'm really trying hard not to over-schedule my afternoons/evenings. I'm editing a couple of vlogs of our vacation, so hopefully I'll be able to post those here soon. I also have a couple of Whole Foods and Trader Joe's "haul" posts to share. We don't have a Whole Foods or a Trader Joe's near us (the closest is 3 hours away), so when we get the chance to go to one, we stock up! I recently had a thermography scan done, and it found that I might have some thyroid disfunction... which I've been suspecting for so many years. But getting the doctors to do anything about it is like pulling teeth. I've also been experiencing some major bloating and stomach issues. So I've decided to take matters in to my own hands and try to turn my health around. I'm going on a strict diet - closely following the blood-type diet... cut out all dairy, gluten, sugar, and certain other things (nightshade vegetables, potatoes, etc.). I'm also switching over to as many natural products as possible (would you like me to do posts about natural products I love? ), and I'm adding some supplements that are beneficial for thyroid function. Ok so that's about it for the updates. To sum up, blog is "blah," work hasn't started yet and I'm already stressing out, Whole Foods Haul coming soon, and strict diet plans are happening. Let me know if you want to see some of my natural product favorites and I'll work on some posts before school starts back up.